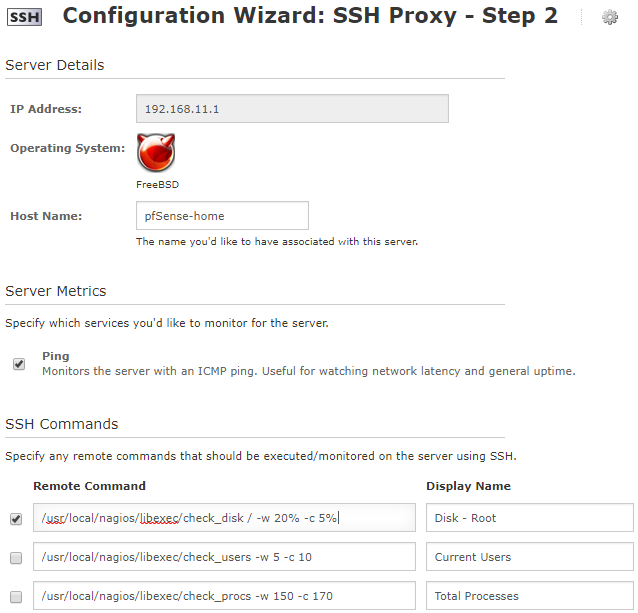 This is the third and final part to monitoring pfSense with Nagios XI using SSH. If you missed either of the previous parts, I’ve included them below. Note: If you’re configuring this on Nagios Core, scroll down to the bottom of this page for the example commands.cfg and services.cfg files. Finally, let’s configure the checks on Nagios XI. 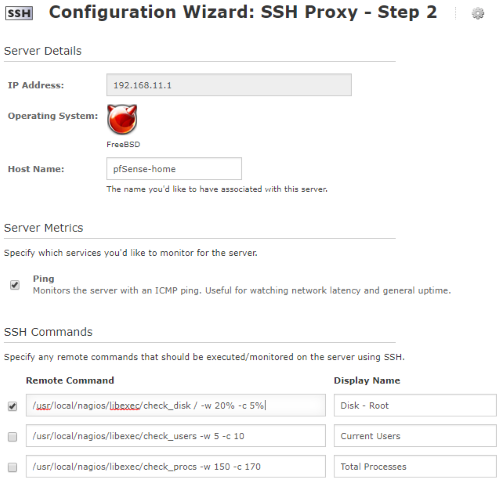 Go to the SSH Proxy wizard. I like to change the OS to FreeBSD, but all that really does is change the icon in the web interface. Change the host name to whatever you’d like. In my example, I chose pfSense-home. At this time, take the checkboxes out of the 2 other remote commands and leave it for the check_disk remote command only. Also, change the remote command to the text below. Make sure you pay attention to the path because the default Nagios entry flip flops libexec and nagios! I recommend changing the display name to “Disk – Root” so when you monitor other partitions, they are all in order in the web GUI. Answer the remaining questions/screens as you see fit. Once the configuration changes are made and the service checks run, you should see something in your Nagios service details. Great start! But where are the rest of the checks from part 2? In Nagios XI, to add more you can do one of two things. Either a) go to the Core Config Manager and copy configs or b) go *back* through the wizard and copy/paste each of the lines below. I prefer the 2nd method because it is far less mouse clicking. Also, if you opt for the CCM copy method, don’t forget to ‘apply configuration’ at the end! Obviously, you will need to omit or change lines to meet the needs of your firewall/environment. For instance, if you use a VPN, you will need to change the IP address and name. You will also need to change the interface names if you want to monitor those. If you use a Windows server for DHCP or DNS, don’t add the service monitors for dhcpd or unbound (DNS). Also note the two entries that have ‘sudo’ before them. If you receive any errors stating there is a problem with “remote command execution failed” or permissions, that is likely the issue. 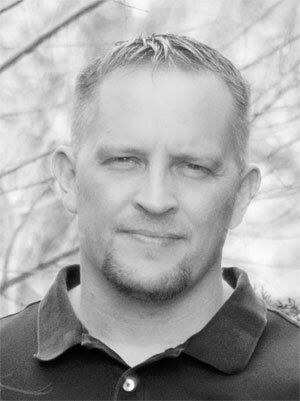 If you need help on configuring sudo on pfSense, refer to part 1 of this series. If you would like a little more details on the individual checks, refer to part 2 of this series. So what does the final result look like (see below)? Beautiful! Now that is how you monitor a firewall! A reader was kind enough to send me their Nagios Core screenshot as well. If there are some particular checks you would like to see added, let me know and I’ll add it in. Better yet, write them up and/or add them to the GitHub repo and I’ll give you credit! I’ve included the Nagios XI services config file so you can download it to compare checks. I’ve also included examples of the Nagios Core services.cfg and commands.cfg files so Core users would have a better idea of how to configure this solution as well. Dallas, excellent write-up. This is working perfectly. btw, thanks for taking the time to write the additional monitoring checks. Save me a ton of time. So happy to hear it helped you out! Thanks for letting me know! Is it mandatory to use the proxy? Is it possible to use another user other than Nagios? for example nagios2? It is kind of a confusing name. The SSH proxy simply means you are checking a service via SSH, i.e. not checking the SSH service itself. In that sense, it really isn’t a proxy as you would think in terms of a web or email proxy that uses a go between service/box to access something else. Hopefully that makes sense. You can name the user whatever you like. After you get the initial password-less SSH configured, you never need to use the username again anyway. Nagios Core uses the check_by_ssh command. Here is a check_by_ssh example for the check_pf_version command. Note: if you have additional arguments, just enclose them in the single quotes as well. Also, make sure you don’t use multiple/nested single quotes in an argument. However, you can use multiple doubles quotes inside a single and vice-versa. I’ll see if I can round up a commands and corresponding config file to post here for Core users in the next few days. I am having problems declaring the check_by_ssh in the file commands.cfg then in the host file the service does not work. Can you help me? more thanks! I have problems declaring the commands to use it as a service. Jordi, there are several ways to configure this and none of them are necessarily wrong. IMO, the commands.cfg is too restrictive and it should simply be a general check_by_ssh. As a result, the services config would define the various checks using the more general check_by_ssh command. In your examples above, the warning/critical ARGS are defined in commands.cfg, but not in the services.cfg, i.e. the ARGS are included in a single argument itself. This morning I added downloadable commands.cfg and services.cfg files at the end of part 3 for Nagios Core users. I would recommend downloading them and then comparing them against what you have. Holler if you need anything else! I have did all step but I have a error could you, please tell is there some option for firewall in the nagios.cfg like adding window, switch that we allow the file of windows and switch? I’m not quite sure what you are asking. At the end of part 3, I have a sample commands.cfg and services.cfg. You should also be able to run the check_by_ssh command below to verify the password-less SSH is configured and Nagios can communicate with the pfSense. If that isn’t what you were looking for, feel free to rephrase your question and I’d be happy to help out! Very good page and nice scripts which I implemented all well over NRPE to monitor my pfsense box running the latest 2.4.3 release. . Thanks for sharing it all ! OK – PF state table: 1152 ( 0% full – limit: 197000) | current_states=1152;state_limit=197000;percent_used=0). in the “status information” column.. Tried to edit the “check_pf_state_table” shell script but no success so far.. Other shell scripts work well and display correctly under status information (for ex. check_pf_cpu). Hey Nicolas! Thanks for the feedback! It sounds like you almost have it. It’s been a while since I used NRPE, but I’m guessing it is a permissions issue. Is ‘sudo’ enabled for that check? NRPE on pfSense should have a checkbox next to each command that allows you to enable that particular check to run with additional privileges. I don’t know if you need to install the separate sudo pfSense package or if it comes with the NRPE package, but that would be something else to check. I’d love to here back when you figure it out! Curiosity got the better of me… I installed NRPEv2 and configured a new check for the state table. Without checking ‘sudo’ the values were empty as you described. Clicking ‘sudo’ and hitting save allowed me to re-run the exact same check from Nagios without any issues. I’ve included my before and after below. any idea is welcome :-)? I think you about have it! FWIW, I’ve never manually added the nagios user to the sudoers file via command line because the pfSense sudo package has a graphical interface (System -> sudo). Assuming your syntax is correct, it appears you are also missing the hostname or IP address in the example above; it appears my previous response back to you removed the “bracket” IP address “bracket” so I apologize for that. Also, I’m not exactly sure if the error response you are receiving is from the Nagios web app or not, but if you test from the command line on the Nagios system you often receive a little more information if you are missing an argument. Good luck! Thank you very much for putting this together. Your documentation is very well written, and the work is great. We have Snort set-up to do IP blocking based on events. I would like to have Nagios display the current contents of the snort2c pf table. I am a System Admin, and we all know that means I don’t code worth a (redacted). What do you think would be the best approach to have a ‘check_pf_snort2c’ type of thing added? Thanks again for the great work and documentation! In your case, you simply want to display the snort2c table? If you don’t need alert logic, displaying that would be very straightforward as the command ‘pfctl -t snort2c -T show’ will show everything in the table. Thanks for a nice plugin. Uptime works but is in status Warning but Status information says correct uptime. Thanks for the feedback Peter! I believe that error indicates you have the sudo plugin installed, however, you may not have the Nagios user added to the sudo/root group (System -> sudo) or have ‘no password’ checked. Try the same commands from the command line (pfSense or Nagios) to see if they work there. Uptime will come back as a warning if the uptime is under 24 hours. More than anything, uptime serves as a visual indicator if the system unexpectedly reboots. Hope that helps! It seems that there is a small bug in the GUI for Sudo, if you create a new row and select/fill in the values and hit save it removes the tick on “No password”, so i just ticked it again han saved it and now it works like it should. Once again, thanks for the work you put in to it. Glad you got it working! I’ll add something to the documentation. Thanks for letting me know!